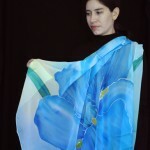 Hand painted silk scarves, using dye. 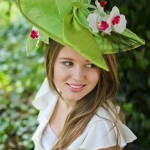 Original handmade millinery designs. 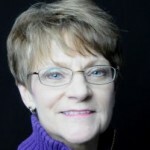 Rose Monzyk was born near Washington, MO and grew up there. She has always been drawn to color, texture and fabrics. It only seems natural then that she would be drawn to creative pursuits. 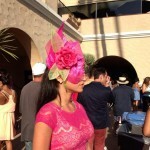 That love of fabric and the fondness for hats brought Rose to millinery studies. She began to study textbooks and started taking classes to fine tune her work. 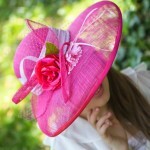 Each hat is made by hand. She begins with flat fabric and shapes it over wooden blocks using heat, steam, and sizing. After drying, the shapes are removed and trimmed. 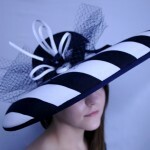 The edges of the brim and crown are wired for strength and then covered with a bias binding. A finish binding is applied as an embellishment. 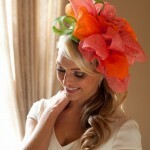 Then the crown and brim are joined using hand stitches the way milliners have always worked. 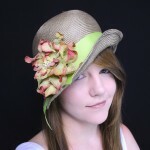 The hat is lined and a ribbon band is applied. Then the embellishment process begins. Combinations of flowers, both handmade and purchased are used along with fabric bows, netting or other refinements stitched on by hand. Each of her designs is one of a kind. 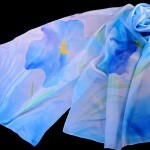 In 2007, Rose started hand painting silk scarves with dye. She chooses a design and draws the image. Then silk dyes are applied with brushes. Each scarf is triple dye set to insure the scarf is washable. It is fascinating to observe how the dyes mingle and move on the silk. Each scarf is completed one at a time. 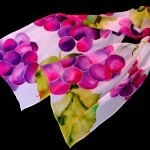 Silk scarves allow another venue for creativity and color.